Firethorn (Pyracantha) is a genus of thorny evergreen shrubs belonging to the Rosaceae family. The plants can grow up to 3m tall if left unpruned and after many years. They have white flowers and either red, orange, or yellow berries. The flowers are produced during late spring and early summer and the fruits develop in late summer, and mature in late autumn. Pyracanthas are valuable ornamental plants, grown in gardens for their decorative flowers and fruit, often very densely borne. Their dense thorny structure makes them particularly valued in situations where an impenetrable barrier is required. They are ideal against walls and fences and make an ideal hedge. Pyracanthas are also a good shrub for a wildlife garden, providing dense cover for roosting and nesting birds, summer flowers for bees and an abundance of berries as a food source. 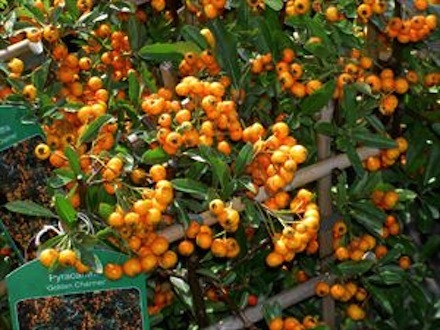 Pyracantha berries are not poisonous. Please note that due to the Sunday Trading Laws, we are not open on Easter Sunday.